This is the night watch man at American Costumes. Of course if he were to rent people would ask for the Knight in Shining Armor. I think the most interesting thing about this costume is that nobody really wants to put it on. Not only is it claustrophobic, but it weighs a ton. The idea of renting this piece of polished metal is to propose marriage to your beloved, being her knight in shining armor …the guy who would die for his princess. Strangely enough he would joust his opponent for her hand..Could you imagine what he would do for her whole body? The costume usually comes with a lance or sword but most people usually use a cane, especially after they come out of it. It’s a one size fits most from medium to extra large and it rents for $250 and it sells for $1500 which is marked down from the normal retail of $2200…We suggest you wear heavy clothing underneath like thick sweat clothes . 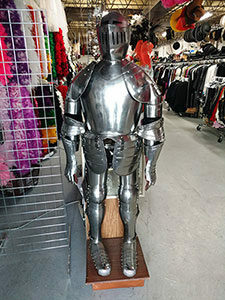 If someone wanted to match this costume, a squire costume would do; also a horse. Some of the fun things to do in this costume is to walk around in a renaissance fair and take pictures, stand out in the middle of the street and sing a song from Camelot to your sweetheart or just put it on in the back yard on a real hot summers day and use it as a sauna. There was one instance where a young lady bought it to put in her living room. When I asked her why, she replied “every woman deserves a KNIGHT IN SHINING ARMOR! DON’T YOU THINK?